The Caspian Sea is the world's largest enclosed water body, and its most remarkable feature is the fluctuations of its level. Throughout historical time, the Caspian level has been below mean sea level. During the 19th and the beginning of the 20-th century, the Caspian stood at -26 m. In 1930, a dramatic drop in its level occurred and continued, with two short interruptions, until 1978 when, contrary to all forecasts, it began to rise (Figure 5.10). The Pleistocene history of the Caspian fluctuations, controlled by tectonic processes and climatic change, and their effects on coastal dynamics are discussed above. This section discusses the modern hydrology and ecology of the sea and their short-term variability. There are three parts of the Caspian, and their morphological and environmental characteristics are different: the shallow (with a depth of 5-10 m) northern Caspian, the deep central, and the southern Caspian sectors. The maximum depth of 1025 m occurs in the southern part. The area of the northern sector accounts for 24 per cent of the total while the central and the southern sectors are approximately equal. The central sector contains about 34 per cent of the entire volume and the southern one accounts for 65 per cent of the Caspian water. The Caspian Sea extends for more than 1000 km in a meridional direction and climatic conditions in the north and in the south are very different. In summer, the water temperature increases southwards from 22°C to 28°C. In winter, the shallow northern sector, which also has the lowest salinity, is ice-bound while in the south the water temperature reaches 11°C (in contrast, temperature varies little with depth because of the intensive convectional mixing). Storms are typical in the north where strong easterly and south-easterly gales are known to be accompanied by water surges which can be as high as 3-4 m and cause floods. The water current in the Caspian is wind-driven and generally follows a cyclonic circulation, being broken into two branches by the Apsheron peninsula. Because the Caspian Sea is an enclosed water body, its hydrological regime is controlled by the processes which occur within its catchment — mainly river inflow and atmospheric dynamics. Over 130 rivers and streams flow into the Caspian, but of greatest importance is the Volga, which delivers about 78 per cent of water received by the sea, followed by the Kura, Ural, and Terek. There is a marginal gain from the rivers of Iran but not a single river reaches the eastern littoral. Rainfall is another important component of the Caspian water balance (Table 5.7). Table 5.7 Characteristics of the mean annual water balance of the Azov, Black, and Caspian Seas. a - From the Black Sea, b - Including 53 km3 from the Sea of Azov and 177 km3 from the Sea of Marmara, c - Including 53 km3 to the Black Sea, 1 km3 to the Sivash, d - Including 33 km3 to the Sea of Azov, 340 km3 to the Sea of Marmara, e - To the Kara-Bogaz-Gol before the dam was constructed in 1980 to prevent water loss to the gulf. The dam was dismantled in 1992 following a rise in the Caspian level. The outflow increased gradually and now exceeds 10 km3. Source: Kuksa (1994). There are two main consumption components: evaporation, which is the major water loss from the Caspian, and the discharge into the Kara-Bogaz-Gol gulf. All components of the Caspian water balance experience strong variability on both long- and short-term scales and so do water level and extent. The major natural factor, controlling water balance and level regime of the Caspian in the past few decades, is climatic variability and the present rise of the Caspian reflects changes in the components of its water balance, such as low evaporation and a higher discharge by the Volga (Table 5.8). Over the last two decades, synoptic conditions over the Caspian basin were characterized by an increasing frequency of zonal circulation and intensified cyclonic activity which were accompanied by an increase in cloudiness, precipitation, and a decrease in air and water temperature and evaporation. There is a fairly close correlation between the changing synoptic patterns and the sea level (TES, 1992). In contrast, analysis of tectonic activity has shown that it has had only a marginal effect on level changes (Kaplin, 1995). Human impacts on the Caspian water balance are undoubtedly high. A particularly important factor is water abstraction from the Volga and Ural, which averages 40 km3 per annum. The salinity of the Caspian varies between the different parts of the sea and also seasonally. It is lowest in the northern sector, being as low as 0.1-0.2 parts per thousand (ppt) near the estuaries of the Volga and the Ural (Kaspiiskoe more, 1986). With respect to most hydrochemical characteristics, the northern Caspian is different from the rest of the sea and is largely controlled by the Volga flow, which in turn is strongly regulated and polluted. In the deep central and southern Caspian salinity averages 10-12 ppt, generally increasing eastwards and southwards as the diluting effect of river inflow becomes smaller and more water is lost to evaporation. The vertical distribution of salinity is fairly uniform and so is the vertical density profile. In winter, the absence of density stratification favours the development of convectional mixing which provides the deep sea layers with oxygen and causes a compensatory upwelling of the deep water, rich in nutrients, to the surface. In summer, a thermocline develops below the layer in which mixing is induced by wind. The drop of the Caspian level in the 1930s stimulated vertical exchange and the aeration of the deep sea water in the central and southern sectors. The vertical distribution of nutrients became more uniform, which created better conditions for biological productivity. This factor has offset the unfavourable effects of increasing salinity and low nutrient supply by the reduced runoff (Kaplin, 1995). In the opinion of most scientists, the present Caspian transgression and the associated decline in salinity should have a positive overall effect on the hydrochemical regime of the sea with respect to its ecology. There are about eight hundred faunal species in the Caspian and, although in comparison with the open seas it is relatively poor, many species are commercially valuable. The southern location of the sea and a large pool of nutrients make it productive while low salinity allows the entry of fresh-water species. The Caspian Sea contains 90 per cent of the world's stock of sturgeon. Although there was a growth in the annual fish catch from under 300 000 tonnes in the 1930s to about 500 000 in the 1970s, the composition of the catch has changed. While in 1913 valuable fish species (mainly sturgeon) contributed 93 per cent of the total catch, in the 1970s only 20 per cent was accounted for by the valuable species (Kuksa, 1994). The drop in the sea level was one of the factors. However, fish population depends largely on the condition of the northern sector, which contributes about 75 per cent of the total catch and 98 per cent of the sturgeons, and this has been adversely affected by the development of the Volga, disturbance of its regime, and pollution. Most importantly, the construction of dams and reservoirs has destroyed spawning grounds and passages upstream. Spawning grounds in the deltas have also shrunk dramatically following the drop in lake level. The latest transgression, the construction of fish passages and development of sturgeon-breeding facilities have partly improved the situation. Yet the problem has not been solved. Although the most dramatic decline in sturgeon population occurred in the 1960s, it continued into the late 1980s and between 1974 and 1987 the spawning stock of sturgeon further declined from 40000 tonnes to 15000 tonnes. The decline in quality of water discharged into the Caspian and pollution from the offshore oil fields continue to affect the food chain and hamper the restoration of the sturgeon stock. Poaching makes a significant impact too. Having said that the current transgression should have a positive effect on the ecology of the Caspian, potential impacts of the further level rise are not obvious. Because sturgeon spawns in the areas of fresh and shallow water, deepening of what is now spawning grounds may adversely affect its reproduction. 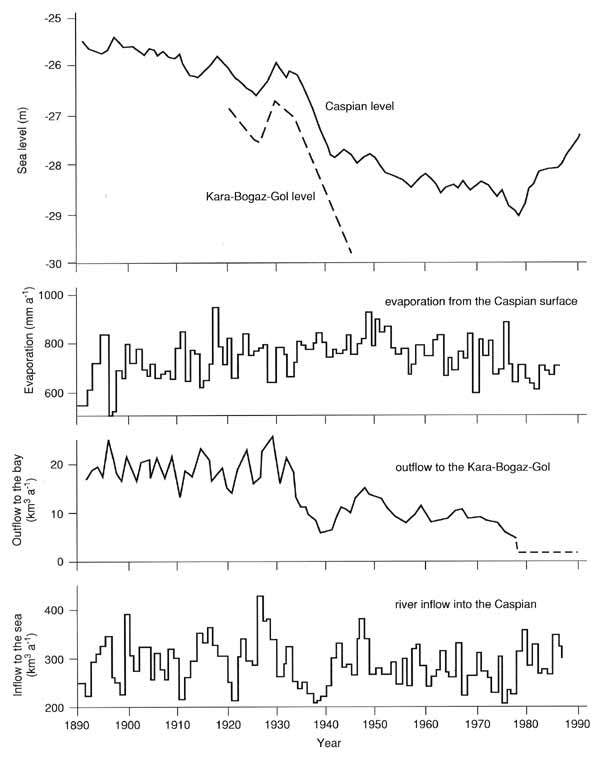 Should the Caspian rise to -2 5 m, the reproductive potential of the Volga delta would drop (Kaplin, 1995). Numerous attempts have been made at forecasting changes of the Caspian level. It is believed that the sea level will reach -26m over the next few decades and stabilize at this level (see above). However, there is no general agreement on the possible action of the sea and there are forecasts suggesting that the level may rise to -25 m and even to the -21m mark by the middle of the 21st century (TES, 1992). Potential impacts, both environmental and social, will depend on the degree of change. Alongside the improvements to the ecological condition of the sea, some adverse effects have been observed such as a rise of the ground water table, mineralization of ground water, and salinization of soils in the Caspian region. It has been estimated that a rise to the -25m mark would inflict widespread economic and social damage associated mainly with coastal settlements, which developed through the protracted sea regression, and the oil industry. Plans for coastal protection are being made by the Caspian nations. However, a better understanding of the Caspian regime and the development of adaptations to the changing sea level are required.